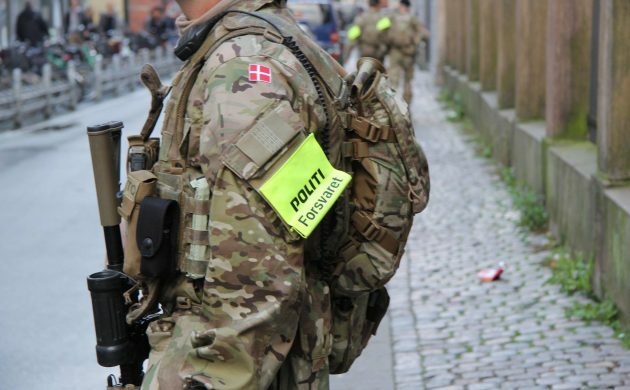 For the first time since World War II, armed troops from the Danish Armed Forces have been deployed on the streets of Copenhagen. Since September 29, a total of 160 Forsvaret soldiers, bearing automatic weapons and special insignia, have been assisting police at potential terror targets in the city, as well at the border controls in the south of the country. These include Jewish institutions such as the Israeli Embassy in Hellerup and Great Synagogue on Krystalgade in central Copenhagen, the scene of the second fatal terror shooting in 2015. If people hadn’t noticed the synagogue before, they certainly do now. Two to three soldiers pace on opposite sides of the street, watching pedestrians as they pass. Cordoned off, it feels like cycling is prohibited, even though it isn’t stated. Copenhagen is starting to resemble a warzone. The government has justified the deployment as a move to relieve the state police, Rigspolitiet, from duties that employed 128 full-time officers, leading to huge amounts of overtime and a neglect of other crime – particularly once the gang war kicked off in earnest over the summer. And they are not alone. France, Belgium, Italy, Britain and Spain have all used troops at some point over the last decade. However, Major Steen Kjærgaard, an international security analyst at the Danish Institute for International Studies, questions whether the freedom the soldiers are paid to protect is actually being eroded by their presence on our streets. “It was a choice of need rather than a choice of want to redirect military capacities to help the surveillance of critical infrastructure in Copenhagen,” he told CPH POST. The longer the soldiers remain, the more normalised it will feel living in a martial state and not having a right to privacy, warns Kjærgaard. “The moment you start re-interpreting the basic rules of a democracy because of an alleged threat of terrorism, you can use the alleged terrorism for a lot of ends,” he said. It is easy to forget, warns Kjærgaard, that the police and the military are very different. They have distinct roles and training, and conflating the two is not only dangerous but creates a “monopoly of violence”. Soldiers are trained to use deadly force as a first resort, while police officers exercise deadly force only as a last resort and shoot to stop, not to kill. Police officers operate among the population to protect security, peace and order internally in society, reasons Kjærgaard. They have been trained to solve problems using a legal system – one in which suspects are entitled to civil safeguards, legal procedures and no detention without proof or evidence. Soldiers, in contrast, are tasked to maintain external security and trained to identify people they encounter as belonging to one of two groups: the enemy and the non-enemy. Soldiers have the right to detain suspects without a charge – for however long they are deemed a threat – and can arrest with just suspicion from an intelligence agency. Scarier, but is it safer? 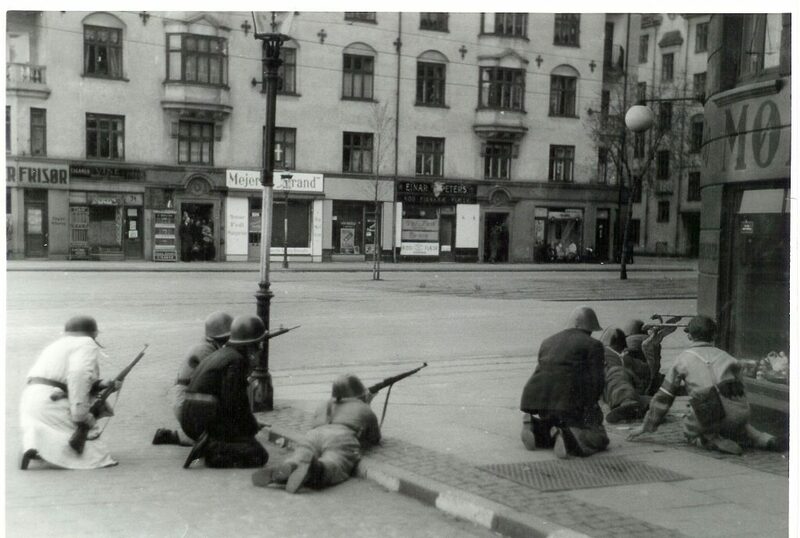 Dea Wallin, a shop assistant working next to the synagogue, was unconvinced the soldiers’ presence will make a difference. The soldiers’ presence is having an effect on people’s peace of mind, she contends. Megan Kenney, an American exchange student, concurs that their presence was at first “alarming”. “The sight of large guns is always unsettling to me and at first I was nervous to walk past them and was hyper-aware of my actions. It changed the atmosphere of the street,” she said. However, now she is used to them she does feel safer – and an added bonus has been a reduction in bike thefts. Kjærgaard, though, remains unconvinced their presence will prevent a terror attack. “I am not safer just because some places are safeguarded. I’m safe because [terrorism] is so random and indiscriminate. It’s important to safeguard the synagogue because it has immense communicative value for terrorists, but making the synagogue a safer place does not make me safer,” he said. Martin Rasmussen, a counterterrorism expert, would tend to agree. “Short term benefits: it takes away some pressure on the police,” he said.